As Originally published by M.A.S.E. LLC, August/September 2007. There is a multitude of children's products and products that may be interacted with by children that can cause injury. Manufacturers like to defer to 'user error' whenever possible, putting blame for injury on the product user. Safety design theory and practice has established that it is the responsibility of the designer and manufacturer to accommodate human behavior. This is especially important when dealing with children - children do not have the body of knowledge and experience that can prevent adults from exposing themselves to hazards. Every possible human action that could lead to a product injury must be considered and dealt with. Over 20,000 emergency-room visits occur each year due to children being injured in shopping carts. Shopping cart injuries can be broken down into main several categories: child falling from cart, cart tipping sideways, and cart tipping rearward. These account for the majority of shopping cart accidents. Children fall from shopping carts when they climb out of the basket section of the shopping cart where many parents put their children. The largest percentage of shopping car injuries is due to falling accidents. This problem has a simple solution, seat belts. Seat belts prevent children from climbing up and out of the basket seat. The seatbelt prevents the child from putting herself in a dangerous position. With the child secured in the basket seat, falling is not a concern. Children also fall while riding on the exterior of the shopping cart. Shopping carts with a high center of gravity can tip sideways, potentially resulting in severe injury to any children riding in the cart. The design of the cart establishes the center of gravity, with crucial elements being the position of the basket, and the height at which the main cart area begins. Carts that have elevated main storage areas will have higher centers of gravity. The wheelbase of the carts will also affect the carts tendency to tip sideways. Siblings pushing or jumping on a shopping cart can initiate a side tip over. Carts must be designed to be stable as empty carts, or carts with any amount of groceries. Rearward shopping cart tip overs commonly occur with a child sitting in the small basket. This added weight can make improperly designed shopping carts more likely to tip rearward. Some carts require very little force on the rear handle to cause a flip, some being able to flip from the weight of a child alone. Carts are more likely to tip rearward with an empty cart than a cart loaded with groceries. The single most crucial element of shopping cart design is the location of the handle in relation to the rear wheels of the cart. Cart manufacturers presumably located the handle at positions rear of the rear wheels to give the user more steering ability. Think of a shopping cart as a teeter-totter. The further away from the middle of the teeter-totter, the rear wheels in this instance, the less force it takes to tip the teeter-totter up. The design priority method of hazard safeguarding involves eliminating a hazard at the design stage as the best, most effective method of safeguarding. For shopping carts, this is simple - remove the child from the hazard. From a manufacturing level, this would involve making a shopping cart that does not have leg holes for a child. This simple modification would discourage carrying children. 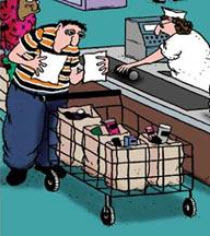 A better solution would be to eliminate the small basket altogether. Some manufacturers have chosen a more proactive approach and make shopping carts with attached childrens' seats. These seats are usually at a low elevation, reducing the falling and tipping hazard. At a individual level, there are numerous ways to remove the child from the hazard, including leaving a child at home, having a friend or parent carry the child, having older children walk instead of being carried, etc. Removing hazards at the design level also includes making a shopping cart as stable as possible, by making the center of gravity as low as possible. A low center of gravity reduces the chance of tipping. Siblings climbing or riding on the sides of the cart could be eliminated by covering the foot rest area with mesh covering on the sides and fronts. This removes the place where children put their feet, which would prevent most kids from attempting to ride on the exterior of the cart. Little has been done to regulate the design and manufacture of shopping carts. Currently there are no adequate performance standards for shopping carts. The CPSC has even denied proposals for regulatory shopping cart standards. This is unfortunate, because a few simple design requirements could drastically reduce the number of accidents that shopping carts cause each year. Our regulatory agencies' lack of action and concern is having an impact on us, resulting in needless injuries, deaths, and brain damage. 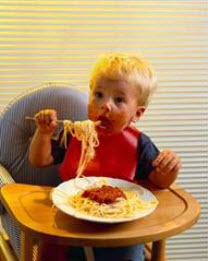 Highchairs are a standard item in most homes with young children. Unfortunately, thousands of children each year are treated for injuries caused by highchair accidents. Deaths occur when unsupervised children slip down in their seats, getting caught between the tray and the seatback, which results in strangulation. Typical accidents include falling from the highchair, tipping of the highchair, and injuries caused by the folding action of highchairs. Falling from highchairs can be prevented by a quality restraint system. Child restraints on modern highchairs come in three-point and five-point harnesses. Three-point harnesses involve a waist belt as well as a crotch belt, and five-point harnesses add a shoulder harness. Without restraints, children may fall by sliding downwards in the highchair, or by climbing out of the highchair and falling. Three-point harnesses are required by voluntary ASTM standards. Three point harnesses prevent the child from slipping downward out of the seat. Five-point harnesses use shoulder straps to ensure that the child cannot climb upwards. Without the shoulder straps a child may stand in the seat, or attempt to climb onto the tray, both of which can result in the child losing her balance or causing the highchair to become unstable and tip over. Most highchairs have what is referred to as a crotch post, which is a fixed member that helps prevent the child from sliding downwards in the highchair. Voluntary standards call for the use of a crotch post. Tipping of a highchair can be caused by a child pushing off of a wall or nearby object, as well as by instability caused by an unrestrained child who is standing on the chair or tray. Highchairs that are not designed for stability may result in a highchair that has too narrow of a base, or the highchair may be too top-heavy. The ASTM standards have stability and load test criteria for highchairs. While compliance is officially voluntary, highchair manufacturers who fail to meet state of the art technology may be found to be producing unreasonably dangerous products. Safety Engineering Resources' determines if a product meets current state-of-the-art technology. We use physical testing in our shop to test products to various industry standards. At times standards will not be adequate, meaning that they do not effectively establish the safety or lack thereof of a design. In these situations, Safety Engineering Resources will develop our own testing criteria, and test the subject product, as well as compare its performance to competitor products. Many highchairs are collapsible for easy storage when not in use. This convenient feature can lead to another hazard - pinch point injuries, as well as potential stability issues. Most highchairs have locks that lock the highchair in place, preventing the highchair from collapsing. We have seen highchairs with a locking mechanism that was completely defective. We tested a highchair's unfolding/locking mechanism, and found that the mechanism failed after less than 20 openings and closings. The mechanism relied on a thin piece of plastic to hold the highchair in the upright position, which was overloaded when the chair was erected and stored. When the plastic broke, there was nothing to prevent the chair from collapsing. Proper design is the first step in preventing this type of accident - locking mechanisms must be designed to be safe for an indefinite lifetime. From an engineering design standpoint, the structural stability of the highchair should not rely on a low-strength locking mechanism. Material defects and manufacturing processes must also be controlled to prevent problems which could result in injured children. Strangulation occurs when children's necks are caught between the tray table and the back of the seat. Unrestrained children can slide downward in their seats and become stuck between these two surfaces. This type of accident is prevented by the use of the restraint harnesses and crotch posts. John L. Ryan, BSME, P.E. is a Mechanical Engineer who provides general Mechanical and Structural Engineering expertise. Mechanical and Safety Engineering (MASE) provides full service analysis and accident reconstruction of products involved in accidents. Mr. Ryan's services have been requested for attorneys and insurance companies needing forensic engineering expert witness testimony to determine whether machinery and products involved in injury cases were adequately designed or whether they have a Design, Manufacturing, or Material Defect. All products are lab-tested on site to determine adherence to industry standards and engineering design protocol. Alternate preventative designs are developed when none exist commercially.